The 2-Port Remote Power Reboot Switch allows you to remotely reboot and control power (on/off) to up to two servers or other powered devices over IP. Control via web interface, Google Hangouts, or command line interface. The ENVIROMUX® 2-Port Remote Power Reboot Switch allows you to remotely reboot and control power (on/off) to up to two servers or other powered devices over IP. Auto-scheduler allows for scheduling power on/off/reboot events. A delay can be set between the reboot of both outlets. Up to 20 schedules can be set to power on or off specific ports at certain times. Multiple control options: Web interface, Google Hangouts, and command line interface using HTTP protocol. Control an unlimited number of Remote Power Reboot Switches from one Google Hangouts account. Up to eight Google Hangouts users can control one Remote Power Reboot Switch. Each Remote Power Reboot Switch must have its own Google Hangouts account. Issue identical commands to multiple Remote Power Reboot Switches by creating Group Hangouts. Checks network connection and can automatically reboot device if there is no response. Automatically reboots selected port if there is no response. Send email alert notifications to any number of addresses. User-specific alert notifications can be configured. Remote reboot of any device, router, server, kiosk, etc. The device need not be network attached. Secure sensitive devices by keeping them powered off when not in use. This prevents hackers from detecting them at all times. Power down equipment when not needed for power savings and to save on wear and tear. Power up alert devices like sirens, lamps, and messages, or environmental system like heaters, coolers, pumps, etc. 100 to 250 VAC at 50 or 60 Hz. 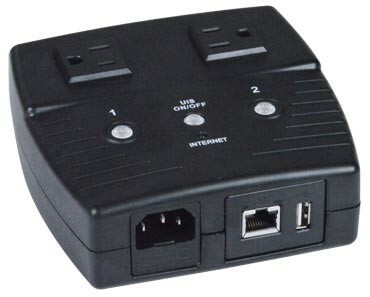 One USB Type A female port for optional USB power. Input connector: one IEC 320 C14 plug. Output connectors: two NEMA 5-15R receptacles. Includes 10A US line cord. 3 ft (1 m) CAT6 cable included. HTTP, TCP/IP, DHCP, UDP, Dynamic DNS, SNTP. Operating and storage relative humidity: 10 to 90% non-condensing RH. How to control remotely power on/off/reboot to up to two servers, routers, web cams, firewalls, or other remote devices over IP.